Do you avoid smiling in public places, and for photos? Do you ever hold your hand in front of your mouth when talking or laughing? If you do, odds are you need a smile makeover. Now you need to take the next step and schedule a consultation with a qualified dentist. In this consultation, you will learn about the many treatment options that are available to you. Here are some of them. 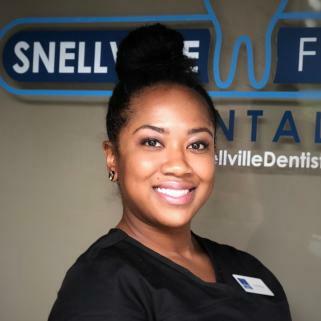 Several things must be taken into account when considering a smile makeover such as your skin tone, facial appearance, hair color, and teeth. The color, width, shape and position of your teeth must also be looked at carefully. The condition of your gum tissue and your lips must also be examined when planning for the perfect smile. If your teeth are stained or discolored, a teeth whitening procedure can get the results you want. If you have silver dental fillings, they can be replaced with natural, tooth colored composite materials. You may also want to consider dental veneers, crowns, bridges, bonding, or implants. Dark or discolored teeth can make you look older than you really are. 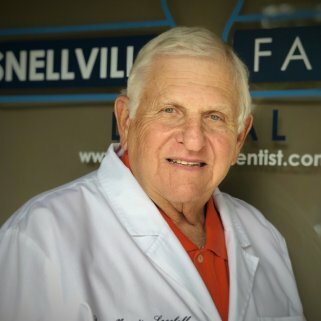 The perfect, white and restored smile will make you look younger. The shade of color for your teeth can be determined by you and your dentist when it is evaluated in context with the tone and color of your face and hair. An experienced, professional cosmetic dentist has the skills it takes to find the right balance, and provide you with the perfect smile. Crooked teeth, teeth that overlap, or that have gaps between them can all be corrected and aligned with the help of orthodontics, or by the use of dental veneers. 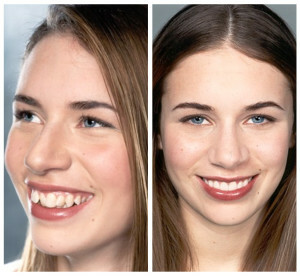 One or more missing teeth can have a negative impact on your appearance and your self-esteem. It can also have an effect on your bite and increase the risk of tooth decay. This can be corrected with dental implants, partial dentures, or bridges. Chipped teeth, cracked teeth, or uneven teeth can be unsightly. These conditions can be corrected with cosmetic bonding. A face that looks aged, or has a sunken appearance can also be improved upon. There are procedures that can help these conditions including oral maxillofacial surgery, and orthodontics. 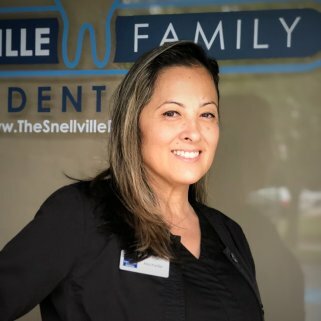 An experienced cosmetic dentist at Snellville Family Dental will work hard to help you develop a plan of treatment for your smile makeover to give you the results you’re looking for. The plan may have a number of components of treatment including teeth whitening, dental bonding, dental veneers, dental crowns, orthodontic procedures, and more. Longer teeth give a more youthful appearance. Aging tends to wear down teeth, and a smile makeover may include reshaping and/or lengthening your teeth. If you have a gummy smile, your dentist may modify your gum line. The smile line can be thought of as an imaginary line that follows the edge of your upper teeth, from one side to the other. It should be the same as the curve of your lower lip when you smile. This is one of the determining factors when a cosmetic dentist is deciding how long your teeth should be. Your teeth should be in proportion with each other. A pleasing smile is usually recognized as one in which the front teeth dominate, and have a width to length ratio of 4-5. 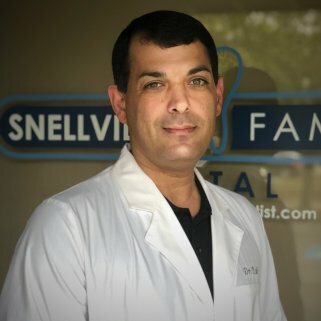 A skilled cosmetic dentist is an expert at blending functionality and aesthetics. They can make your teeth look more masculine or feminine, and give you a natural look and feel. 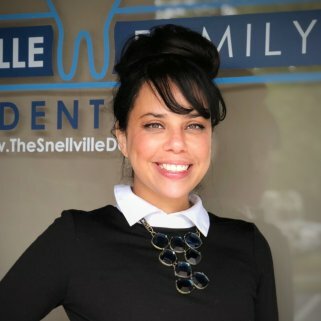 Dr. Nabi and Dr. Socoloff at Snellville Family Dental, are experts in smile makeovers, having done hundreds over the years. 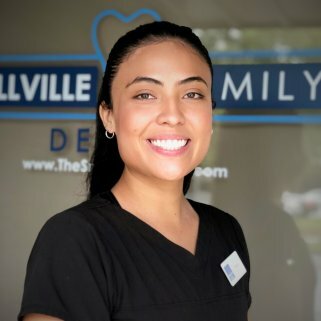 They work in tandem with a staff of an experienced and professional group of dental lab technicians to create natural looking results with all of our dental restoration and cosmetic procedures. Your teeth after the smile makeover procedure will look, feel, and function like the rest of your teeth, they will just look just like the rest of your teeth. You look and feel better about yourself, and your friends and family will notice the difference as well. 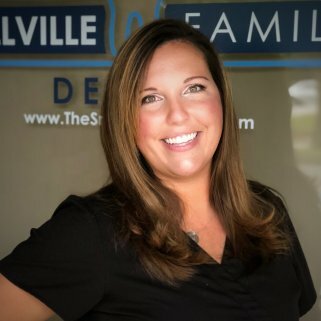 If you want to learn more about smile makeover, or any of our other dental restorative procedures, please feel free to Contact Us our office, and schedule a consultation with Dr. Nabi or Dr. Socoloff.